My Lifelong Love features thirteen of Georgia Stitt’s original songs performed by some of the entertainment industry’s most exciting singers, including Jesse Tyler Ferguson (TV’s “Modern Family,” The 25th Annual Putnam County Spelling Bee), Anika Noni Rose (The Princess and the Frog, Dreamgirls, TV’s “The Good Wife”), Brian d’Arcy James(TV’s “Smash,” Shrek, Titanic), Susan Egan (Beauty And The Beast, Thoroughly Modern Millie), Shoshana Bean(Wicked, Hairspray), Heidi Blickenstaff ([title of show], The Addams Family), Laura Osnes (Anything Goes, Bonnie and Clyde), Christopher Jackson (In The Heights, TV’s “The Electric Company”), Michael Arden (Bare, Source Code), jazz duo Jessica Molaskey and John Pizzarelli, Kate Baldwin (Finian’s Rainbow) and Michael McElroy (Rent, Broadway Inspirational Voices). 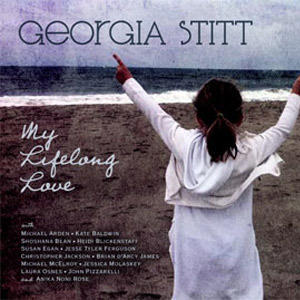 Stitt’s My Lifelong Love is a collection of songs about love in its many incarnations: first love, lost love, love of music, love of children, and ultimately, love of self. Deeply personal and written from a distinctly female point of view, Stitt’s music draws from classical, pop, gospel and musical theater influences. With lush orchestrations by Don Sebesky, Jason Robert Brown, Sam Davis and Stitt herself, each of these songs illuminates an emotional truth with thrilling and sensitive musical storytelling. In addition to the lyrics by traditional musical theater writers like Marcy Heisler and Bil Wright, My Lifelong Love also features Stitt’s settings of poetry by Dorothy Parker, Derek Walcott, Alicia Partnoy and the Bard himself, William Shakespeare. Music by Sam Davis and David Kirshenbaum is also showcased, with lyrics by Stitt.